The Tercel is a subcompact manufactured by Toyota from 1978 to 2000 across five generations, in five body configurations sized between the Corolla and the Starlet. Manufactured at the Takaoka Plant in Toyota City, Japan, and sharing its platform with the Cynos (aka Paseo) and the Starlet, the Tercel was marketed variously as the Corolla II—sold at Toyota Japanese dealerships called Toyota Corolla Stores—and was replaced by the Toyota Platz in 2000. It was also known as the (Japanese: Toyota Corsa) and sold at Toyopet Store locations. 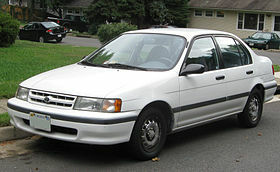 The Tercel was the first front wheel drive vehicle produced by Toyota, establishing a layout and frame that was later used in popular Toyota models. For example, Toyota Corolla E80’s frame is almost similar to AL20 Tercel’s frame. Also, Toyota designed a new A engine for Tercel, attempting simultaneously to achieve good fuel economy and performance and low emissions. Choice of body styles increased as well, with the addition of a four-door sedan. The name “Tercel” derives from the Latin word for “one third” as the Tercel was slightly smaller than the Corolla— much the way “tiercel” refers to a male falcon, which is one-third smaller than its female counterpart. All Tercels were assembled at the Takaoka factory in Toyota City, Aichi or by Hino Motors in Hamura, Tokyo. Hino assembled the third generation Tercel from 1987–1990 for the two–door and some three–door models.